Have you been hit by a car, motorcycle or truck while riding a bicycle? Seriously injured cyclists deserve compensation. Bicycles are a great way to get exercise and enjoy the outdoors, and in Illinois’ warmer months the temperatures are perfect for doing both. Unfortunately, bicycling has become a dangerous mode of transportation in recent years as more and more adult and children riders are involved in traffic accidents while on their bike. Did you know that the National Highway Traffic Safety Administration (NHTSA) has reported that in Illinois alone, more than 660 pedal cyclists were killed in 2011, 69% of which were male and 9% of which were 14-years-old and younger? Unfortunately, many of these accidents were preventable and often caused by drivers that are simply not paying attention to driving while they are behind the wheel. Have you been hit by a car, motorcycle or truck while riding a bicycle? Do you know that you may be entitled to compensation that can help you cover medical expenses, hospital bills, lost wages because of time out of work and other financial necessities that resulted because of the accident? The legal team at The Tapella & Eberspacher Law Firm believes that the victims of car and bicycle accidents deserve to be treated with fairness and compassion in a court of law. There can be severe physical and emotional harm as a result of a bicyclist’s collision with a motor vehicle, which is why we will always fight for the MAXIMUM amount of compensation due to our clients. To find out how we can help you, call us today at (855) 522-5291 or fill out our "Get Help Now" form on this page. We offer bicycle accident injury victims 100% FREE consultations and we only get paid when we win. According to the NHTSA, bicyclists are considered motor vehicle operators, and need to behave as such when riding on Illinois streets and roadways. Bicyclists are required to obey traffic signs and signals, lane markings, and be sure to ride in the same direction as traffic. The NHTSA also notes that motor vehicle operators need to become more aware of the presence of bicyclists to help prevent these accidents. In turn, bicyclists should always wear the proper gear when riding, like brightly colored or reflective clothing to help drivers see them. The physical damage that can result from a car and bicycle collision is often debilitating or life altering for the cyclist. In many cases the rider will die because they simply do not have the physical protection that a car gives its driver. Sometimes an accident can occur as a driver is pulling out of a parking space or turning a corner, and because they do not anticipate a cyclist they do not yield. Yet another scenario can take place as a driver opens their car door without checking for a cyclist approaching quickly from behind them. Following these tips will help bicyclists stay safe on the road. Motorists must learn to be aware of the potential for riders wherever they are, and if a bicyclist is on the road, give them ample room as you pass. 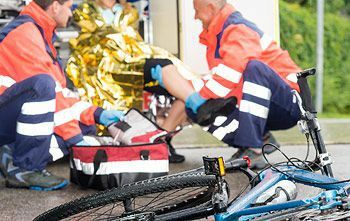 The injuries that a bicycle accident victim can sustain are frequently severe enough to put the rider in the hospital for days or weeks. They might require surgery and a lengthy hospital stay coupled with the expense of an operation can financially cripple the victims and their families. The compensation that can come from a successful verdict or settlement can help cover these and other costs so you can recover with peace of mind. Don’t suffer in silence— seek legal representation from an experienced auto accident litigator and ensure that justice is done. We are proud to represent the victims of bicycle and auto accidents and to protect their rights during difficult times. Our attorneys have the passion and knowledge to competently represent you or your loved one in court, and we want to help you fight for the MAXIMUM compensation for your auto accident. Begin here by filling out the “Get Help Now” form on this page – It’s that easy and completely confidential. At The Tapella & Eberspacher Law Firm, we're here to help and only get paid when we win.